ORLANDO, Fla., April 16, 2019 /Christian Newswire/ -- Christ for all Nations (CfaN) is thrilled to announce that Jeremy Riddle (Bethel Music) is the latest addition to the remarkable lineup for the 2019 Light the Fire Again Conference (LTFA) In Toronto, Canada. He joins speakers and worship-musicians from around the world, including CfaN Lead Evangelist, Daniel Kolenda, Heidi Baker, Carol Arnott, Carlos Annacondia, Shawn Bolz, Joshua Mills, Cindy Jacobs, Nathan Morris, Michael Koulianos, Eric Gilmour and many, many more. It's going to be a phenomenal, Spirit-lead event. 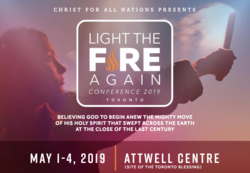 LTFA will be held May 1st through 4th at the Attwell Center in Toronto, Canada – the very same building where God poured out His Spirit in the 1990s during a multi-year revival known as the Toronto Blessing. As Evangelist Kolenda said of the upcoming conference, "We are believing God to begin anew the mighty move of His Holy Spirit that swept across the earth at the close of the last century." There is every reason to believe God will answer that prayer. At 2018 LTFA, leaders of past revivals and out-pourings gathered to celebrate all God has done and to declare His will for the future. Now, in 2019, LTFA leaders and attendees are in full anticipation that God will make good on His promises – His Spirit will be poured out on everyone. The Toronto Blessing was known for, among other things, the unforgettable music that emerged. Worship-evangelist and CfaN staffer, Charles Ciepiel points out that, "There was a distinct sound to the move of God in the 1990s that profoundly influenced the church at large. Many amazing artists from that era led worship at the 2018 LTFA. So, to have Jeremy Riddle and Lindy Conant-Cofer – two artists at the cutting edge of today's worship experience – really makes sense. There's continuity in the fresh, Spirit-saturated sound from one generation to the next." Some seating is still available. However, seating is increasingly limited, so register soon. To learn more, visit www.lightthefireagain.org. Founded by Evangelist Reinhard Bonnke in 1974 and now led by Evangelist Daniel Kolenda, Christ for All Nations (CfaN) continues to pioneer mass-evangelism in Africa and beyond and to equip the church to fulfill Christ's Great Commission. To date, more than 78-million people have chosen to follow Jesus at a CfaN Gospel Outreach Campaign - meetings marked by supernatural displays of God's power to heal bodies, restore lives and change communities. With offices in Australia, Brazil, Canada, Germany, Hong Kong, Singapore, West Africa, South Africa, United Kingdom and United States. CfaN produces written, musical and video content that can be found online and seen daily on TV stations around the world. To learn more about Christ for all Nations, visit CfaN online at www.cfan.org, email srodriguez@cfan.org or call 407.854.4400.